Today we released a long-awaited update to Animoog with fixes and improvements for the modern iOS landscape (iOS 8, 64 bit devices, latest Audiobus, IAA, …). An important improvement is that Animoog will now properly handle full-rate MIDI coming from the Eigenharp, LinnStrument, Continuum, … The massive amount of expression messages used to sometimes put Animoog into a weird state. We tracked this bug down and fixed it, making Animoog an excellent choice for any controller that supports polyphonic aftertouch! Tagged with Animoog, Controllers, iPad, Moog, Synth. That’s great news, Geert! Downloading it now to try out with LinnStrument. I searched a bit on the web and wasn’t able to confirm how well (or not) Animoog works with those controllers and what are the limitations, if any. What’s your experience Geert? This is still work in progress v2.2.5 will have support for linear pitch bend of external controllers like LinnStrument, making those slides much more predictable. Poly-pressure can already be used to play one expression parameter per note, we’re now working on full 3D note expression support. Has full 3D support arrived yet? I am very inspired by Geert’s work, i downloaded Model 15 as soon as saw the video with Nick Batt, I now use my Ipad in the studio! 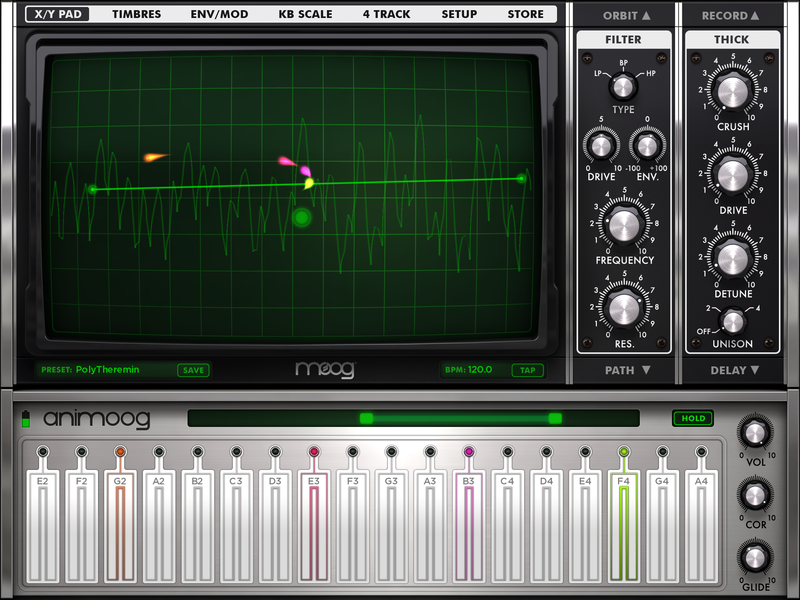 it has me rediscovering Animoog, and getting exited about buying a Linnstrument to use with it. i detail i enjoy about the Model 15 app is the rotary input option for the knobs, it work nicely with a regular stylus on Ipad air 1.
is there any chance we could see this small feature in an Animoog update? Sorry, I can’t comment on what might or might not come in future Animoog updates. We take note of your request though.